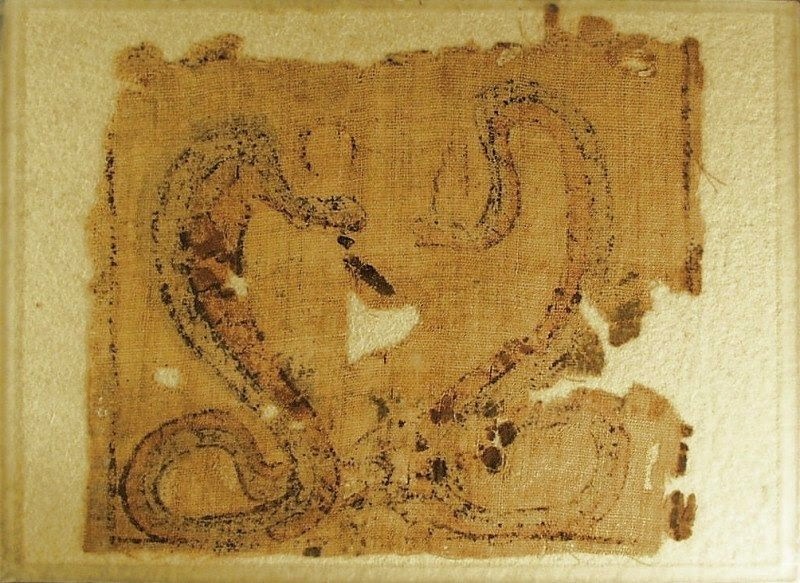 This piece of painted material, which dates from the Graeco-Roman Period, depicts two divinities in the form of a serpent. They are without any doubt Agathos Daimon, the good genie protector of the town of Alexandria, and Isis-Uraeus. They are respectively wearing pshent head-dresses, the pharaonic double crown of Upper Egypt and Lower Egypt, and a crown composed of a solar disk and cow's horns. The bodies are marked with black and reddish colours. The two divine serpents, creations of religious syncretism of the Graeco-Roman Period, often decorate stelae, coins and the walls of tombs.